If you are serious about SEO in 2019 for your Website or YouTube video( related to birthday niche), than this is best campaign. And my guest post site can increase your website authority and rank. There is one component that you must not forget to incorporate in your strategy — backlinks from High Authority Sites. You can buy also for YouTube. I am sure you know very well about it and if backlinks is made with trust flow that will make your Google ranking good. We do not make all backlinks at once, because that could make your website de-indexed in Google as it will see many backlinks at onces. So if you buying that kind of backlinks, please avoid it. This service will increase your blog rankings, because the level of trust is far higher than of any ordinary SEO methods! List Of Domain With High Page authority. I will add guest post, image & video related to topic. Will make some backlinks to your links, to give more power. Your keyword(s) as anchor text. Free instantlinkindexer.com submission to get links crawled by Google. Provide Report to make you sure i added link. 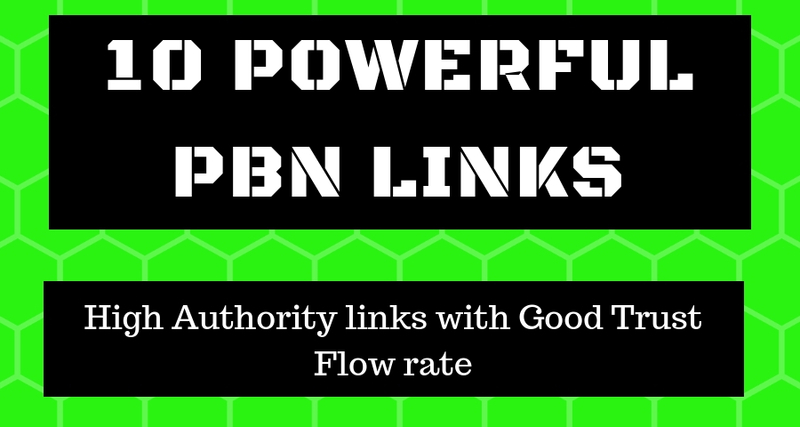 10 Permanant DA 30+ TF 15+ Homepage Dofollow PBN Backlinks is ranked 5 out of 5. Based on 173 user reviews.